We have become big pork eaters in the past couple months. Funny thing is, I usually never keep anything in the freezer except for some ice, vodka and ice cream. Over the weekend I opened it, after being gone for a month, and there staring me in the face was a few packages of pork and wild boar! We decided to have a nice Sunday dinner as we have not cooked for most of the summer. I kept it simple; lightly seasoned pork tenderloin, roasted tomatoes, and a green salad. Lucky for us and lucky for you, we had leftover pork which we used to make up this delicious Spicy Pork Tenderloin Sandwich. One of the things we have been carving since coming back from France is spicy and I knew as I started pulling items out of the fridge that this would be a spicy sandwich. Not much is in there but I did find some mayo and sriracha; this would make a fantastic base. As well I had a crusty freshly baked baguette from the market, a juicy heirloom tomato and a few greens. I coated the bread with butter and browned it until crispy and warm. I kept the tomato simple, sliced with a little black sea salt and the greens I lightly tossed with a little olive oil and balsamic – mainly to have them glisten. Layers of thinly sliced pork tenderloin were bathed in the spicy mayo and then cradled by the summertime additions. It was perfect with a glass of Rose! Thinly slice pork tenderloin, wrap in foil and gently warm in the oven at 200, for about 10 minutes – do not dry out. Slice baguette in half, butter, and toast. I used a stovetop grill pan to toast the bread until golden and crispy. While bread is toasting, mix mayo and sriracha. Toss greens with olive oil and vinegar, just enough to make the greens glisten. mear both sides of the baguette with the mayo/sriracha combination, layer with the pork, then the greens and finally the tomato slices. Finish with a sprinkle of black sea salt and a grind of fresh pepper, top with remaining baguette. 8 Responses to "Spicy Pork Tenderloin Sandwich"
Okay, i shouldn't have come here before lunch because i'm seriously craving now. 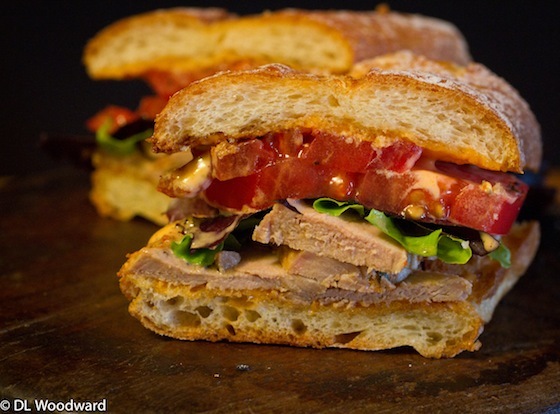 The sriracha mayo with the pork sounds like heaven. Now i'm gonna have to suffer because i'm home and there's nothing in my fridge. :) Nicely done! This sounds like the lunch I am now planning to fix my company for lunch tomorrow. You were "carving" for something spicy, I am "craving" a "carved" spicy pork tenderloin on baguette. Thanks for tempting me.